The breadbug family is a family of creatures in the Pikmin games. The first members of this family were seen in Pikmin, but the actual family was not mentioned or named until Pikmin 2. Notoriously, the smaller enemies in this family mimic the appearance of Bulborbs in the grub-dog family. Olimar's notes for the Dwarf Red Bulborb do mention "vanilla breadbug", but it is unclear if this is Olimar's way of referring to the simple Breadbug, or if there is an enemy called "Vanilla Breadbug". They have a range of lifestyles depending on the particular species, from scavenging for second-hand kills to actually preying on smaller creatures. It is interesting to note that each member of this family can be instantly defeated or at least damaged by throwing Pikmin onto its back. For some reason, in Pikmin 2, thrown Purple Pikmin will remain attached to small Bulborbs until the enemy's life ends. Breadbugs, found the first two Pikmin games, are the beasts after which the Breadbug family is named. 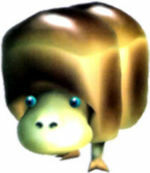 They are unable to cause harm to Pikmin directly, though one can do so by pulling objects away into its dwelling. If any Pikmin are carrying an object while it is sucked underground in this manner, they will die. The beast is heavy with thick blubber, making it immune to most attacks. They are found much more commonly in Pikmin 2 than in Pikmin. The Crumbug made its debut in Hey! Pikmin. It resembles the Breadbug, but it is fairly smaller. It doesn't actively pursue Pikmin, but can kill them effectively if it gets near. Main article: Dwarf Red Bulborb. Dwarf Red Bulborbs are small, common enemies in the Pikmin games. They resemble Red Bulborbs in appearance, but with greatly diminished size. These enemies are easily defeated by swarming them, but throwing a Pikmin directly on top of one will lead to an immediate kill. In Pikmin, these were known only to be a separate species from Red Bulborbs, but in Pikmin 2, they were revealed as members of the Breadbug family rather than the Grub-dog family. In the first game, agitating one will make it scream, possibly awakening the nearest Red Bulborb. Main article: Dwarf Orange Bulborb. 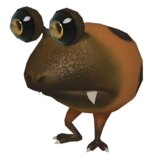 The Dwarf Orange Bulborb is an enemy in Pikmin 2 and Pikmin 3. It mimics the Orange Bulborb, but, like all other Breadbug family members, it is diurnal, unlike the nocturnal Orange Bulborb. Being as easily agitated as the Bulborb it mimics, it will notice Pikmin at a greater distance than other Dwarf Bulborbs do. It can be very easily defeated by swarming them or by aiming a single Pikmin throw to land on its back. Main article: Fiery Dwarf Bulblax. The Fiery Dwarf Bulblax is a subspecies of Dwarf Bulborb that appears in Hey! Pikmin. They are similar to the Fiery Bulblax in appearance, with some minor differences; its eyes are both the same size (though its pupils are not), and its "melted" appearance is much less severe. The Fiery Dwarf Bulblax is the only "dwarf" equivalent of a Bulblax. Like the Fiery Bulblax, the Fiery Dwarf Bulblax's back is constantly burning, meaning it can only be attacked effectively by Red Pikmin. Besides eating Pikmin, it can spit fireballs to attack. These fireballs, as well as its body, can cause the ground to light on fire, requiring the use of Red Pikmin to extinguish it. Fireflap Bulborbs are winged creatures found in Hey! Pikmin that are closely related to the Fiery Dwarf Bulblax. They are legless, with thin eye-stalks and red beady eyes. Its back and wings are orange with red and black stripes, and are constantly ablaze, similar to the Fiery Bulblax and its dwarf counterpart. Fireflap Bulborbs fly high in the sky, and attack by dropping flaming projectiles from above. According to the enemy log, these projectiles are actually discarded skin. Like other small enemies, they can be defeated by throwing a single Pikmin onto them. The Giant Breadbug is a boss in Pikmin 2. Unlike other Breadbugs, this one is large and has a more cubical shape, looking like a whole loaf of bread. It is by far the largest species in the Breadbug family, but at the same time is considered by many players to be the easiest boss in the game; the boss theme music is not even played when this creature is around, though an exclusive tune is played only in the specific cave sublevel. The more recognizable habitat is located on the last sublevel (6) of the Glutton's Kitchen and consists of only two other Breadbugs, electrical wires, and Anode Beetles. The Snow Bulborb only appears in Pikmin 2. They are another subspecies of Dwarf Bulborb, these particular ones resembling hairless, miniature Hairy Bulborbs. They are as similar to the beast they endeavor to copy as any other Dwarf Bulborb, and defeated in much the same way. Their most common location is in the vicinity of one or more Hairy Bulborbs, or in cave terrain of snow or ice. The family is named after the Breadbug, a bug-like enemy that resembles a piece of bread. In the scientific name of members of this family, the word Pansarus is a pun, in that pansa is Latin for "splayed-foot", and the creatures' feet are in fact splayed, and panis is Latin for "bread", once again tying in to the Breadbug; パン? is also Japanese for "bread". The word pseudooculii in some species names is a combination of pseudo, which is Greek for "fake" and oculli, referring to the genus name of mature Bulborbs. 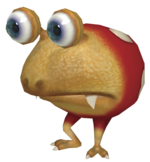 Because some members of the Breadbug family are mimics of a species of the grub-dog family, their names use the word "Bulborb" as well, which originates from the grub-dogs. This page was last edited on January 29, 2019, at 16:06.